WASHINGTON—Slowly coming to the realization that something was terribly wrong, President Trump reportedly awoke Friday to discover his entire body covered in dozens of small cuts after being chased through his dreams by a menacing Robert Mueller brandishing fingers covered in razor blades. “Oh, thank God. It was just a dream,” said Trump, just before seeing the very real, tiny wounds on his arms and chest that mirrored the lacerations he had received as the psychotic special prosecutor pursued him down the halls of the White House within his nightmare, laughing maniacally while he slashed violently at the president. “What—no. This isn’t possible. It was a dream! 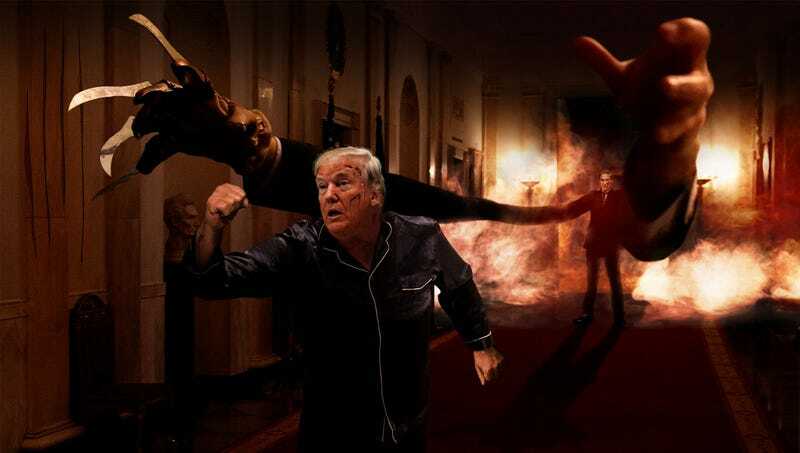 It was just a dream!” Trump later discovered that he was still asleep the moment Robert Mueller’s razor claws burst through the president’s mattress, dragging his struggling body down into its seemingly endless depths.